You know about fire extinguisher safety, but do you know how to safely clean up after using a fire extinguisher? Fire extinguisher safety is a popular topic, as it is crucial for everyone to know the proper technique for handling fire protection equipment. However, it’s also important to know what to do after putting out a fire. 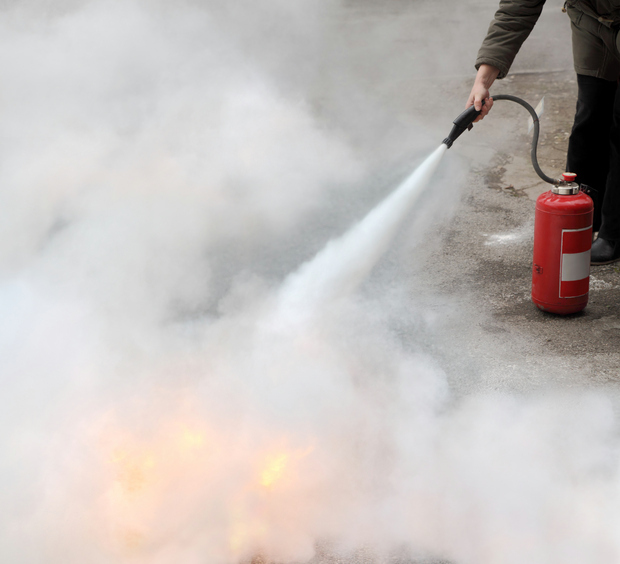 If you’ve ever used a portable fire extinguisher to successfully put out a small fire, it is a great feeling of relief, but you must also know how to clean up the residue. Here is a guide of tips and recommended cleaning methods to use for cleaning up different types of fire extinguisher residue. If any reside is stuck, spray the area with isopropyl alcohol diluted 50 percent with warm water. Allow this solution to sit for a few minutes before wiping with a damp cloth. As for sodium bicarbonate and potassium bicarbonate residue, apply a solution of 98 percent hot water and 2 percent vinegar. To neutralize monoammonium phosphate residue, apply a baking soda and hot water paste. Once again, allow the solution and paste to sit for a few minutes before wiping with a damp cloth. If the fire occurred in a kitchen, wash all dishes and cookware with residue in the dishwasher. If any clothing was covered in residue, wash in a washing machine. For a final clean, wipe the area down with soap and water and rinse clean. Use fans to help the area dry quickly. Rinse eyes immediately if any chemical gets in them during clean up. Next, wipe away the residue with a sponge or rag with hot, soapy water. As mentioned above, wash all dishes and cookware, and rinse all surfaces that came in contact with the residue. Before turning the power back on and using the cooking equipment, make sure everything is completely dry. Clean agent fire extinguishers are used for putting out electrical fires, as they are non-conductive and do not damage computers or electric devices. The clean agents simply dissipate into the atmosphere and require no cleanup. This entry was posted on Wednesday, May 23rd, 2018 at 4:15 pm. Both comments and pings are currently closed.